Google, Twitter, Aliens, And Internet Memes: The Truth Is Out There. 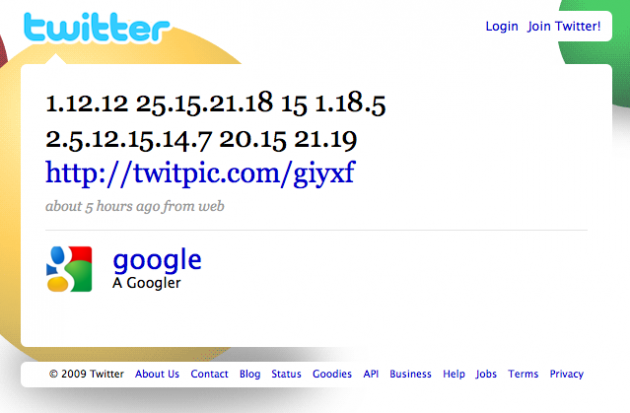 When Google officially joined Twitter back in February, its first message was sent in code. Earlier tonight, Google reverted to using a coded message on Twitter, with a cryptic tweet stating the following, “1.12.12 25.15.21.18 15 1.18.5 2.5.12.15.14.7 20.15 21.19”. So what does it mean? It’s fairly straight-forward, actually, assuming you know your Internet memes. The code itself is a simple pattern, A=1, B=2, C=3 and so forth. Plugging it in, this translates to: “All your o are belong to us”. 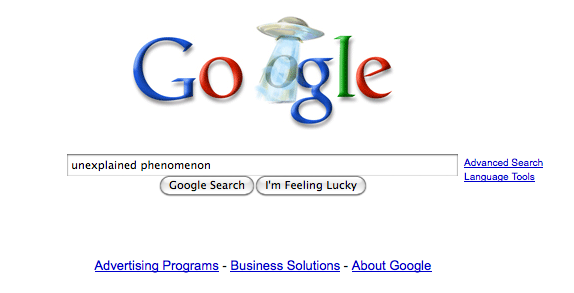 It’s not really clear why that is Google’s logo today; the logo just links to the Google result for “unexplained phenomenon,” which returns results mainly talking about Google’s odd logo today, and general alien conspiracies. Maybe someone at Google is just bored and wanted to play a game, or maybe they just saw District 9. The truth is out there.